Seventy-year old Parsotam Bhikha set up shop in Braamfontein almost 50 years ago. He has witnessed the suburb's blooming from a white working-class place of semi-detached cottages, sleazy hotels and tiny flats, to a hip and funky highrise space now. Braamfontein's alleyways are being regenerated - Mario Soares in progress. He remembers Braamfontein with a few high-rises - the tall building he is in, Heerengracht, had just gone up and he was the first tenant. He had to have a white nominee to rent in the suburb. And a white secretary, tucked away somewhere. 'We had to feed the white inspectors,' he says, with a wry smile. Braamfontein these days is a different planet. It's full of vibrant, youthful energy from thousands of students who live and play there. But also small, young businesses with offices off the streets. Galleries, restaurants, bars, hotels and coffee shops have popped up. There are even a few shebeens, I am told. A jazz club is to open soon. There's the fabulous if bursting-atthe-seams Neighbourgoods market every Saturday. The Beach on the rooftop of a three-storey building in Juta Street, where you can sit under an umbrella, curl your toes in the 40 tons of beach sand and sip whatever you fancy. And there's Critical Mass, where you can pull up with your bike every last Friday of the month in Juta Street, to ride en masse around the CBD in a great community event. Braamfontein, along with the CBD, experienced a dip in the 1990s when businesses moved out of the city, although heavyweights like Sappi, Liberty, SA Breweries and the JD Group remained in the northern side of the suburb. But in the mid2000s, things started turning. These corporates invested in their immediate surrounds, planting trees and gardens, and creating quiet cul-desacs. Sappi pumped money into the park below the Joburg Theatre, and transfor med an untidy patch of grass into a delightful oasis. These efforts filtered southwards. Ten years ago, South Point property developers moved in. Today they own about 30 buildings which they rent to about 5 000 local and international students. They have commercial and retail interests too. Now the alleyways are getting some fussing. 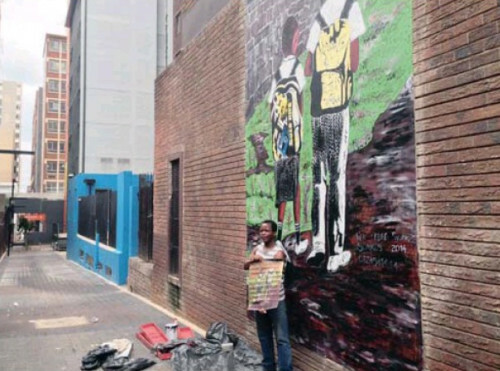 Often places of criminal activity, garbage and informal toilets, Braamfontein's alleyways are going to become mini galleries, with 10 murals to brighten them up in a project sponsored by the city. If you've taken a stroll through Braamfontein lately, you would have noticed playful umbrellas hanging in several alleys. That's the start of it. One of the murals has already been completed, Umbrellas by Pumla Gqada. The murals will be in a range of media - mirror tiles, woven bottle tops, multi-layered plastered surfaces, chevron signage, and paint, says Stephen Hobbs of Trinity, the company overseeing the project. He says they are planned for three alleyways, and the biggest will be Craig Smith's work, Guardians, taking 150m of wall space. All the artists work or live in Braamfontein. It was very much a community and workshop approach, adds Hobbs, aimed at giving lesser-known artists some exposure, with a space in one of the buildings being donated for workshop sessions. 'It will be looking at how street art comes in different shapes and forms,' he says. All the artworks will be in place by March. Trinity has recently resprayed those metal trees in Juta Street in bold colours. It also looks after the grand Eland sculpture at the top of Jan Smuts Avenue. 'Braamfontein is a cool, urban hub now,' says Hobbs. But the alleyways are going to get another shot of energy. 'The alleyways are going to be galleries and public space connectors,' says Josef Talotta of South Point. What that means is that those that were gated in the 1990s are opening up, walls are going to be bashed through, with glass fronts announcing shops. He's converting an old service courtyard into a café, with cobbles and plants. An ad agency already has its entrance in an alley. Talotta rattles off all the businesses and NGOs that have recently discovered Braamfontein - the Branson Centre of Entrepreneurship, Nu Metro, Puma, the Swiss Arts Council, Lawyers for Human Rights, the World Wildlife Fund, the L'Oreal Institute, Virgin Mobile, ThoughtWorks, a US IT company, and others. What I find interesting is that a collaborative approach between the NGOs and students is being planned, where students will do internships with NGOs or masters students will act as advisors to NGOs. Talotta says there are international students renting apartments from South Point, bringing a cosmopolitan dimension to Braamfontein. Talotta walks me around. He points to the absence of hanging signs above the pavements on the buildings along De Korte Street that South Point owns. They have been taken down. 'It increases the sight lines and gives a subconscious feeling of safety. There is uniform lighting, giving it an up-to-date aesthetic.' That attention to detail makes all the difference. He stresses that Braamfontein is not being gentrified, but rather regenerated. 'We are trying to keep the old too.' Eventually they want storyboards in the suburb, detailing its history. 'Our core business is the student lifestyle, the youth energy. This is complementary with what Adam is doing,' says Talotta. Adam Levy moved into the suburb in 2005. He bought 155 Smit Street, a glass fronted building on both north and south sides. He has the two-storeyed penthouse, which he took three years to transform into probably one of the city's trendiest places to live. He reckons he gets up to 6 000 visitors to his Neighbourgoods market on a Saturday morning, of which a lot are foreigners. That adds up to a million since 2011, when it opened. It attracts people from the northern suburbs too, who probably would never otherwise have ventured south of Sandton. 'It is a very different experience from the one they would have expected,' says Levy. Back in 1966 Bhikha opened Civic Tailors and Outfitters in De Korte Street. He learnt tailoring from his brother, who opened Clifton Tailors in Jorissen Street in 1947. His brother closed two years ago, but Civic Tailors endures. Bhikha has clients coming for suit alterations from Sandton, Pretoria, Roodepoort and Midrand. He once tailored to former government minister Charles Nqakula, and deputy president Kgalema Motlanthe. He no longer makes suits, he says, because you can buy a suit these days for a quarter of the price. I took a pair of pants in, the zip was refusing to close. He had them fixed in an hour.